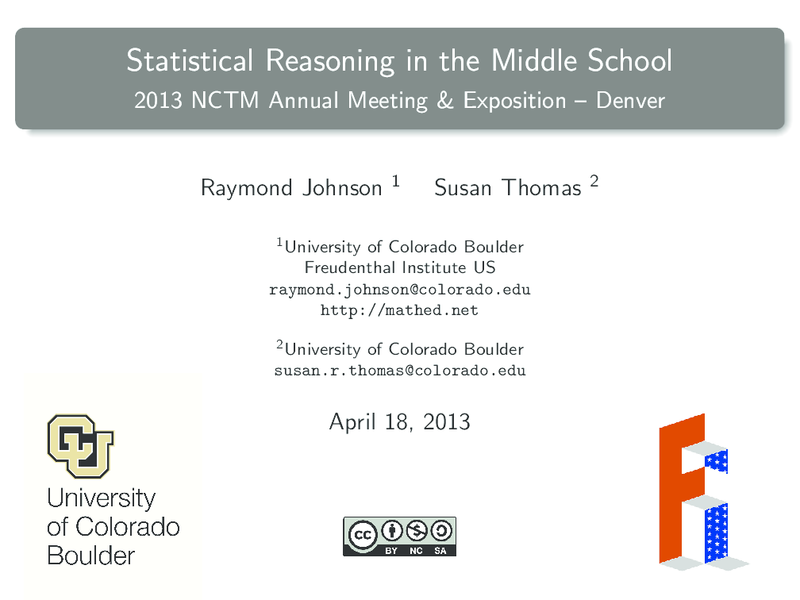 My colleague Susan Thomas and I took an interest in middle school statistics during our first year in our PhD program. When we read the statistics standards in the Common Core State Standards (CCSSM) for middle school, we both thought they were a major shift from prior standards, and we wondered how teachers would perceive them. For our qualitative research project, we found two willing middle school teachers who offered us access to their classrooms and time for interviews. The data we collected suggested that these teachers, both well-educated and in a high-achieving school, had some difficulty interpreting some of the standards, were unclear about some of the bigger ideas those standards might lead to, and did not have curriculum to support the level of thinking and reasoning called for in the CCSSM. The push for more statistics is reflected in each iteration of major standards documents (NCTM 1989, 2000), the GAISE report, and the CCSSM. Some of this comes from the relative youth of statistics as a field. 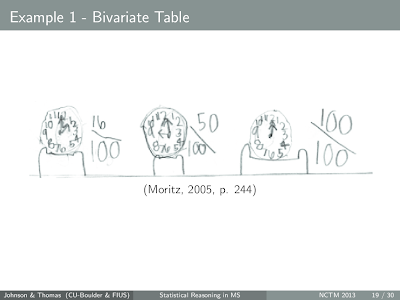 I've heard teachers say, "Why do we teach boxplots? 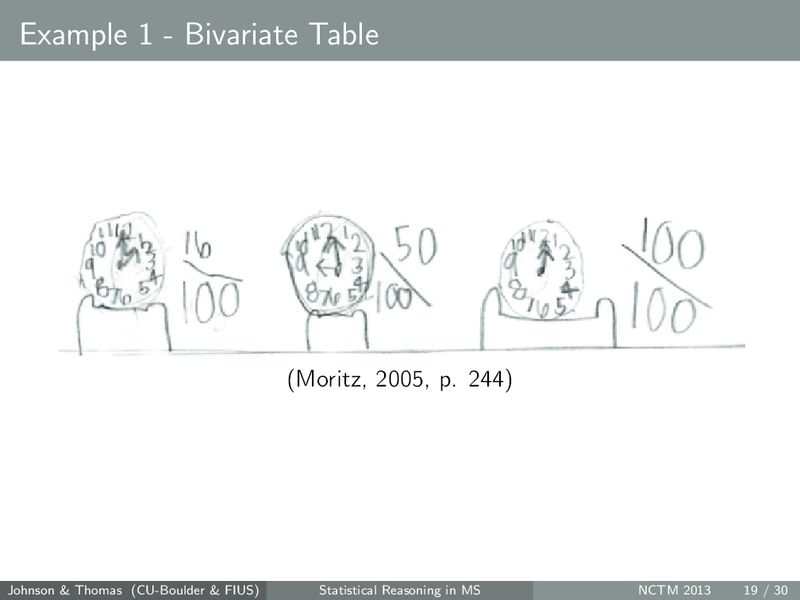 We didn't learn them when I was in school," not realizing that John Tukey didn't invent them until the 1970s -- in many cases, the teachers are older than the plots. How often as math teachers do we get to teach anything younger than we might be? More obviously, the push for statistics is part of the explosion of data in our world. Google's Eric Schmidt recently claimed that "There were 5 exabytes of information created between the dawn of civilization through 2003, but that much information is now created every 2 days, and the pace is increasing" (Kilpatrick, 2010). Even when the topic isn't "big data," increasingly we collect more and more information about our own activities. Making sense of data requires statistical thinking and reasoning. To understand statistical reasoning, it's helpful to have a way of thinking about how statistics is different from mathematics. In 1962, John Tukey wrote, "Statistics is a science in my opinion, and it is no more a branch of mathematics than are physics, chemistry, and economics; for if its methods fail the test of experience -- not the test of logic -- they are discarded" (pp. 6-7). A more recent and helpful perspective of statistics comes from Michael Shaughnessy, who said "The twin sister of the 'certainty' in mathematics is the 'uncertainty' in statistics. We must prepare our students to deal with both types of quantitative reasoning as they grow in the mathematical sciences" (2010). So what is statistical reasoning? According to delMas (2004), statistical thinking is knowing when and how to apply statistical procedures, while statistical reasoning explains why results were produced or why a conclusion is justifed. That means that things like stating implications, justifying conclusions, and making inferences are all part of statistical reasoning. For this workshop, the strategy Susan and I used was to: (a) identify in each grade level of the middle school CCSSM a theme related to statistical reasoning, (b) find something in the research literature that might help teachers better understand what kind of reasoning to elicit and look for in their classes, and (c) evaluate some statistical tasks for their ability to elicit that reasoning. Susan got snowed out on the wrong side of Vail Pass, but thanks to our preparation together I was able to soldier on without her. When we looked at the 6th grade standards, we saw a common theme of reasoning with variability and distribution. 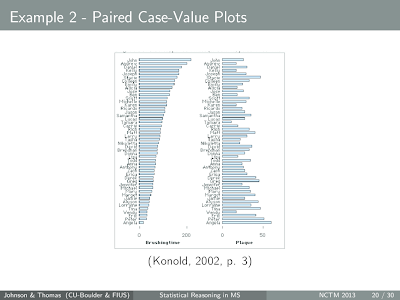 Yes, there's focus on measures of center and procedural things like knowing how to calculate the IQR and MAD, but all that is supported by reasoning with variability and distribution. The work of Bakker and Gravemeijer (2004) stuck out to me in how they approached student reasoning with variability. "An underlying problem is that middle-grade students generally do not see 'five feet' as a value of the variable 'height,' but as a personal characteristic of, say, Katie" (Bakker & Gravemeijer, 2004, pp. 147-148). 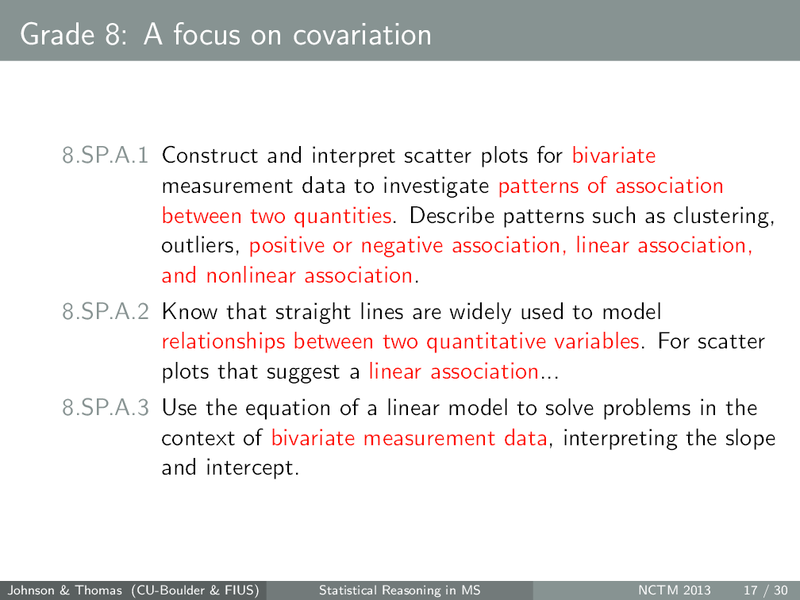 The suggestion was for students, instead of always assembling data points into distributions, had opportunities to deal with distributions that obscured individual points. 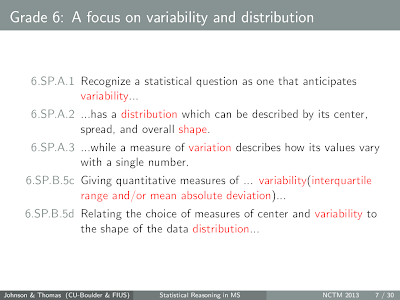 By focusing more on distributions and variability, students will be more prepared later to reason with standard deviations, margins of error, and other topics in high school and beyond. Often the best part of leading a workshop is simply giving teachers time to talk and share ideas. If you look at the tasks and want to share ideas, please do so in the comments. Across the 7th grade standards we see a strong theme for reasoning with sampling and inference. The focus on informality here is key, as a standard like 7.SP.B.4 is not trying to suggest hypothesis testing and t-tests, but instead a basic understanding for how variability in samples indicates uncertainty about population parameters, either as a single sample or in a comparison of samples. conceptual operations centered around the images of repeatedly sampling from a population, recording a statistic, and tracking the accumulation of statistics as they distribute themselves along a range of possibilities" (p. 261). 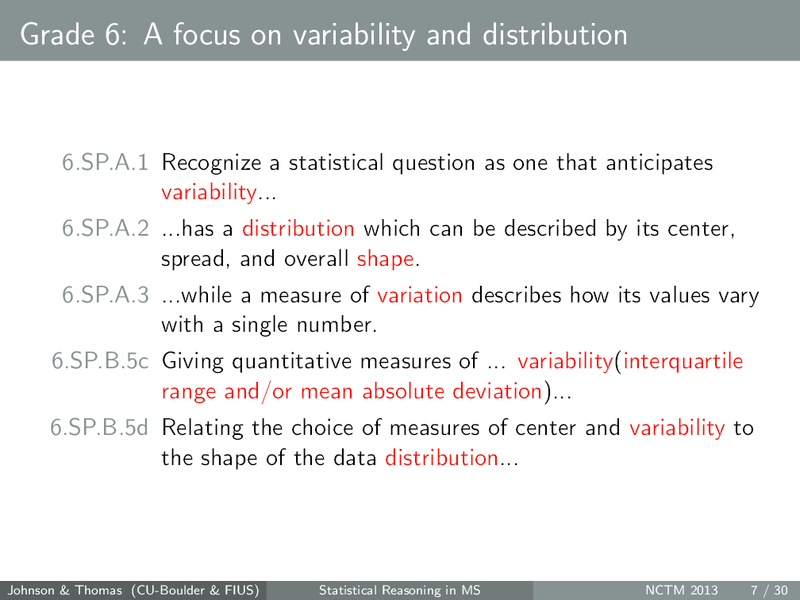 Together with reasoning of variability developed in 6th grade, these standards address the crux of inferential statistics: sampling distributions. There was a lot of good discussion about the Counting Trees task and speculation around student strategies. There's a clear intersection here with students' reasoning with ratio and proportion, and one teacher suggested instead of using the diagram in the task, using aerial or satellite photography with real trees. The key idea, however, is giving students opportunities to sample in different ways and reason why different approaches yeild different, yet similar estimates for the population. 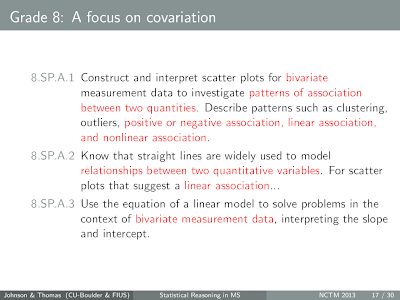 The clear unifying theme across 8th grade CCSSM standards is covariation of two variables. There is some real opportunity to have this support 8th grade algebra standards related to graphing lines and linear equations, and I'm anxious to see curriculum that really ties the two together. 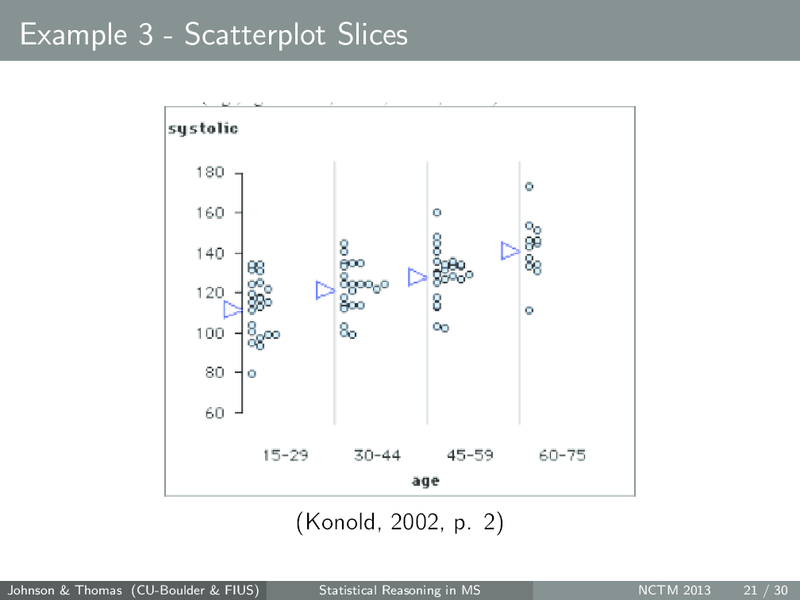 We ran short on time for much of a discussion on these tasks, but participants were looking at how scatterplots were used and thinking about how else students might reason with covariation. Of course, none of the tasks used in the session were meant to be perfect, and none teach themselves. Instead, it's important to find the most promising tasks we can, understand them as part of a greater curriculum, and attend to the student thinking and reasoning they might elicit. Lastly, here are the resources we recommended at the end of the workshop. By no means is this an exhaustive list. It's just a place to start for teachers looking to supplement or revise their curriculum. Bakker, A., & Gravemeijer, K. (2004). Learning to reason about distribution. In D. Ben-Zvi & J. Garfield (Eds. 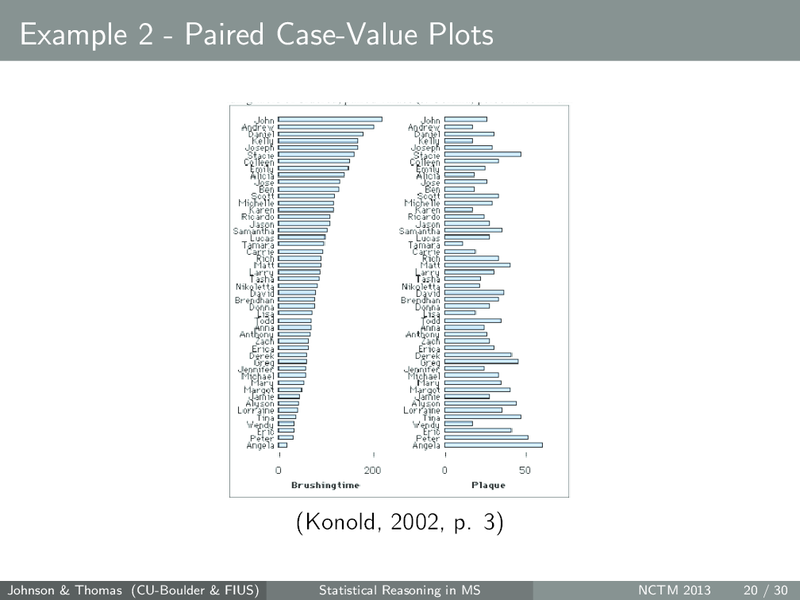 ), The challenge of developing statistical literacy, reasoning and thinking (pp. 147–168). New York, NY: Kluwer. Rubin, A., Bruce, B., & Tenney, Y. (1991). 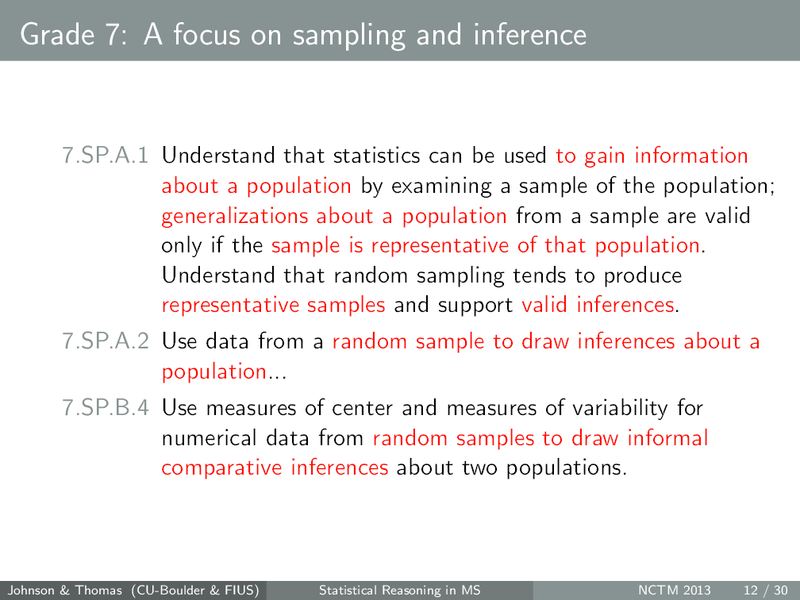 Learning about sampling: Trouble at the core of statistics. In D. Vere-Jones (Ed. 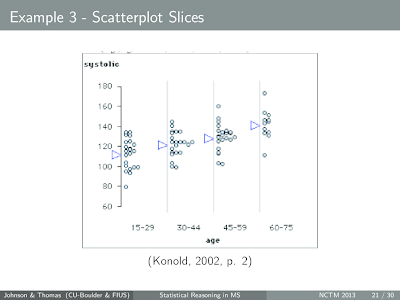 ), Proceedings of the Third International Conference on Teaching Statistics (pp. 314–319). Voorberg, The Netherlands: International Statistics Institute. Saldanha, L., & Thompson, P. (2003). 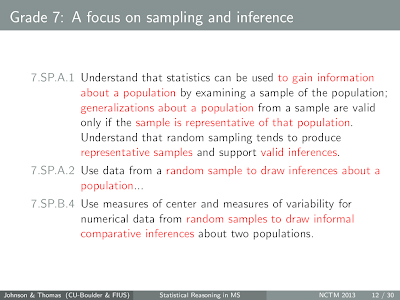 Conceptions of sample and their relationship to statistical inference. Educational Studies in Mathematics, 51, 257–270. Tukey, J. W. (1962). The future of data analysis. The Annals of Mathematical Statistics, 33(1), 1–67.